Is the Silicon Valley real estate market really weakening? Have we peaked and started our decline? I have been hearing some doom and gloom lately with the real estate market and I'm here to tell you we aren't anywhere near the "real estate abyss." Since many folks have not lived here for the past 10 years and have never experienced a real down real estate market, I thought I would show you five points worth noting. First, the bottom of the market was in 2009, which makes sense when you look at the graph below and see the number of single family residence (SFR) homes for sale versus the actual sales. the period 2008-2011 saw a huge disparity between inventory and actual sales, and as you can see in the past decade, the demand for homes has been relatively steady. It's the inventory that has been the difference. Basic supply and demand. Second, now that we can look back for the past 1-1.5 years, as a a broker for the past 30 years, I can see that supply was the lowest inventory in the past decade and with a scarcity of homes for sale, no wonder there was a strong pent up demand to buy, and it was common to have five to twenty offers or more for any given SFR, driving up prices fast. Some neighborhoods saw a sale price upwards of 120% of list price in a given moment. I pulled the data for the graphs from MLSListings.com. It didn't take much effort to sell in the past five years with very low inventory and we would have sold more if we had more. Third, mortgage interest rates have been some of the lowest rates in the past century until recently when rates went over 4% and many buyers took advantage of that. Many of us remember or bought homes at rates above nine percent... and we were grateful if we took action! It has risen to 4.8% and is expected to go to 5% per government expectations but is still low. 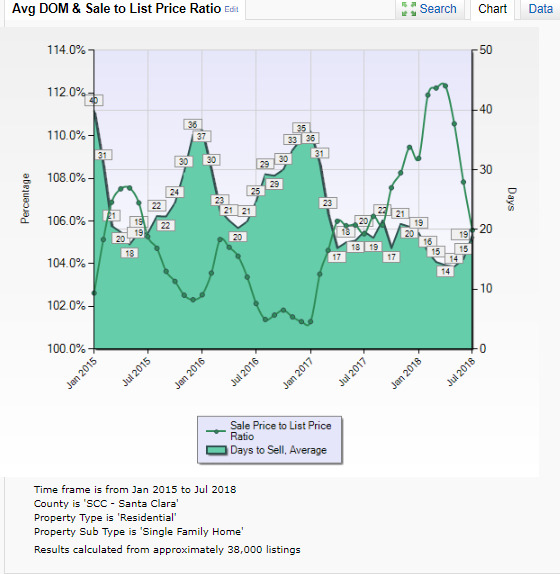 Fourth, you may be hearing that prices are dropping now and no one is buying, however the facts show that while the sales price is coming down, it is still well over 107% of list price. When the price is above 100%, it can be a seller's market and less a buyer's market. We just went through a time when actual sales price were about 110-120% of list price. And the days on market (DOM) to sell went from 12 to 19 days in the past couple months. Poor baby! You can generally see that the summer period is sort of the "dog days of summer." Now sellers and agents need to hustle and provide value to sell homes as the market starts to experience some challenges, and it remains to be seen if this is a downward trend or simply a pause, a calm before the storm. Many of us can remember that it actually took 30-90 days or more to sell a home... yes! ... let alone the short sale and foreclosure days in 2006-2011 when homes could take as long as two or three years to sell. Now that is a tough market! From my hands on vantage point, historically, to me, the strongest periods to sell and activity are in the spring and fall, not the summer, when many think it would logically be the logical choice. Lastly, I'm no economist but it seems to me that we have some big companies that are buying land like crazy like Apple and Google, to name a few, who seem to be banking or major expansion or storing their wealth in real estate. If and when these new major project are started, I have a feeling we will see the same financial appreciation like we saw around the new "Apple Spaceship." 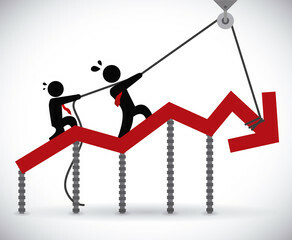 Unless something major happens to our economy or we have some political fall out, it looks me like we still have a good, strong, seller market ahead so if you are thinking of selling, the next few years may be the time to do it. I am already seeing the first phase of baby boomers selling and moving out of the area. I continue to be amazed at the Silicon Valley real estate market activity, the high prices, low inventory amidst the backdrop of the economy and politics. Just when I've seen it all, something else comes into the picture. What is going to happen in the next half of the year could really impact the market... or not. What would I be thinking about in the next few years or real estate? Just keep paying attention to the road signs so you can withstand the bumps in the road of real estate. Be clear of your objectives and desired outcomes. Don't be over extended with debt or bad cash flow like in 2005-2009. Take care of your property. Owning beats renting. Time heals all real estate as it can never go to zero like stocks. Even if your property does not appreciate, you have paid down the loan and build equity and a nice retirement plan while investing your time into a neighborhood and community. Where will I retire? Plan ahead. I hear many boomers not sure where to go and are stuck. Just a few thoughts about the past decade in real estate I wanted to share. OK, I feel better already. How about you?